The ordinary grandstand tickets give you access to most of the entire track. The Mall is unique in MotoGP affording seating with views north and south. Since the event never gets crowded you will be spoiled for choice. We do sell the K1 tickets on the first corner, but this doesn't permit access to the mall, so we don't recommend. Bear in mind it does tend to get humid; one of the great selling points of the VIP Village is its air conditioning! You also get PADDOCK ACCESS! We have added our own Pole Position Club private hospitality suite. This is the perfect compromise between ordinary grandstands and full VIP. TEAM EXPERIENCE: Our special Team Experience packages are available for this event. This sets you up as a guest of one of our sponsored teams for the weekend, with paddock access, pit visits, rider meetings, and more! 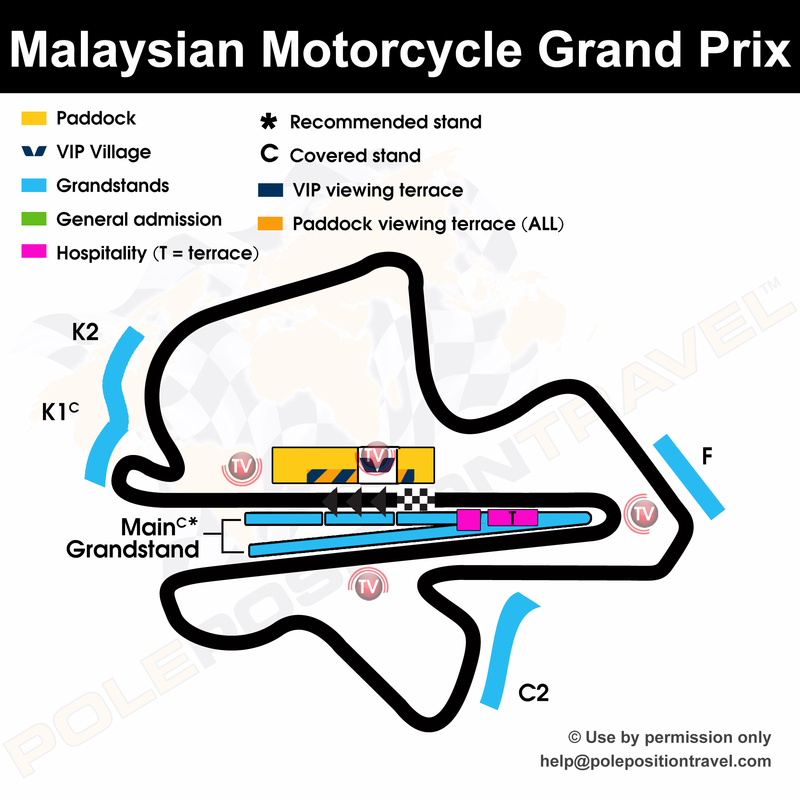 MotoGP guests also will have the opportunity to visit the track itself (service road). The teams do not have hospitality units (although you can visit your MotoGP Team office for a drink and a cool-down). There is a paddock restaurant, or if you like you may also purchase our Pole Position Suite hospitality in the Mall at a €200 discount.